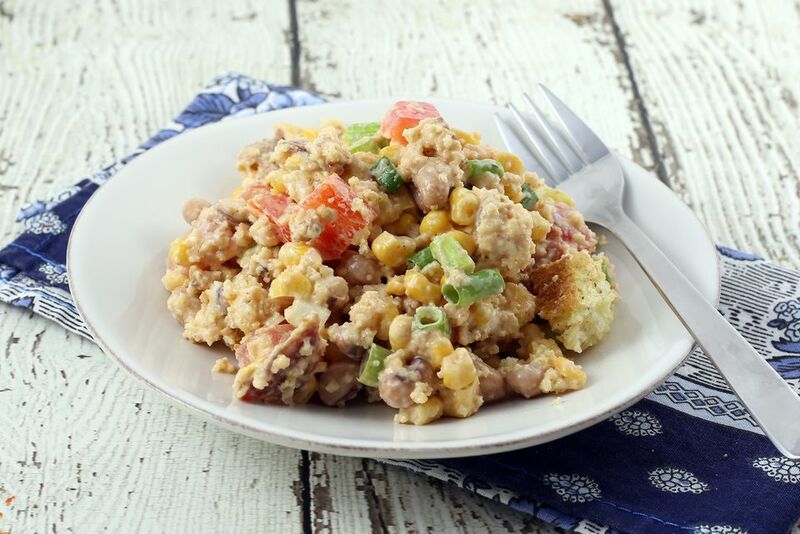 Southern cornbread salad is one good reason to make two or more batches of cornbread at a time. Use the second cornbread for a delicious salad or freeze it and use it later. Suzi's cornbread salad is a delicious combination of baked cornbread, cheese, plenty of crispy crumbled bacon, pinto beans, and vegetables. The salad is perfectly dressed with a ranch-style sour cream and mayonnaise dressing. Feel free to tailor the cornbread salad to suit your taste. Reduce or increase some ingredients, omit the bacon or cheese, or use less dressing mix. Use the included recipe for buttermilk cornbread or make your cornbread from your own favorite recipe or a mix. Heat the oven to 425 F (220 C/Gas 7). Put 1 tablespoon of shortening in a 9- or 10-inch skillet and place the skillet in the oven. Combine the cornmeal and flour in a large bowl and add the baking powder, soda, and salt. In another bowl whisk the buttermilk with the egg and 3 tablespoons of melted butter. Take the skillet out of the oven and place it on a rack. Combine the dry mixture with the buttermilk mixture and stir to blend well. Pour it into the hot skillet and return the skillet to the oven. Reduce the oven temperature to 375 F (190 C/Gas 5) and bake the cornbread for 20 to 24 minutes, or until browned and crusty around the edges. Remove the cornbread to a rack and cool completely. Stir together salad dressing mix, sour cream, and mayonnaise until blended; set aside. Combine the chopped tomatoes, bell peppers, and onions. Toss gently. Crumble half of the cornbread into a large bowl. Top with half each of beans, tomato mixture, cheese, bacon, corn and dressing mixture. Repeat layers. Cover the bowl and chill the salad for at least 3 hours. When ready to serve, take it out of the refrigerator and gently stir the mixture. Replace the ranch dressing mix with taco seasoning. Replace the pinto beans with black beans.